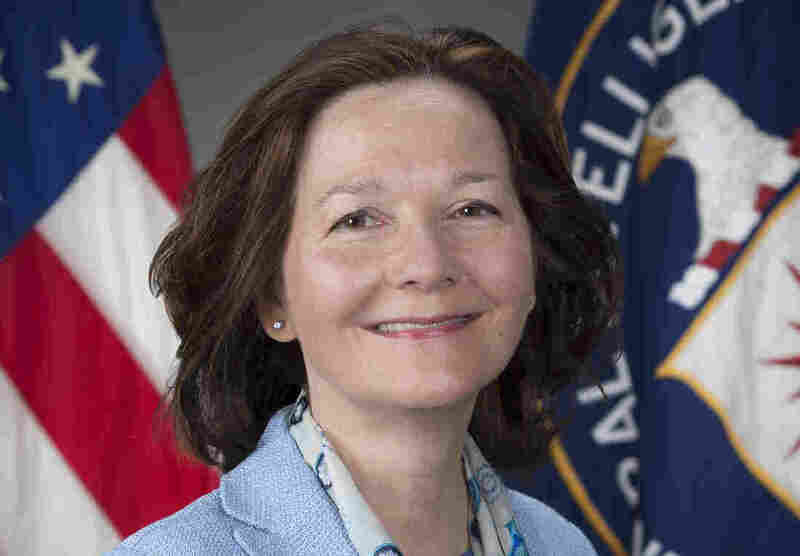 Haspel's Nomination As CIA Chief Is Reopening Debate On Torture : Parallels Waterboarding and other harsh interrogation methods appear set for another round of litigation in the court of public opinion as the Senate prepares to vote on Gina Haspel as CIA director. Gina Haspel, an undercover CIA officer for three decades, has been nominated to become director of the spy agency. Several senators say they will be asking tough questions about her role in the CIA's waterboarding program that began after the Sept. 11, 2001, attacks. Waterboarding and other harsh interrogation methods appear set for another round of litigation in the court of public opinion as the Senate prepares to vote on Haspel's nomination. In many ways, U.S. laws and policies are much clearer today than in the past and have effectively settled some legal questions. President Barack Obama banned torture with an executive order in 2009. The Republican-led Congress followed up with its own torture ban in a 2015 law. The Army Field Manual spells out which types of interrogation are permitted, and waterboarding is not among them. Still, that doesn't mean the discussion is over. Not by a long shot. "The debate that will occur around the Haspel nomination may help clear the air by putting these issues before the public," said John Prados, a senior fellow at the National Security Archive, a nonprofit in Washington that advocates for government openness. However, if Haspel and the CIA are not forthcoming, it could create a new backlash, he warned. "I believe the agency is mistaken if it thinks it can escape from what happened here," added Prados, a frequent critic of the agency and the author of The Ghosts of Langley: Into The CIA's Heart Of Darkness. John Rizzo, who was the CIA's acting general counsel in the period after the Sept. 11 attacks, also believes a renewed discussion could be helpful. "Now, with the benefit of time, I think the country would be well-served by a reasoned, non-emotional discussion about whether any kind of interrogation technique, beyond a standard Q&A, is ever justifiable — or effective, for that matter," Rizzo told NPR's Morning Edition. However, Rizzo, who said he has known Haspel since the 1990s, remains a supporter of the tough interrogation methods. "I have some regrets, but I still continue to believe the program was effective," he said. "I have a strong feeling that the information in question — and there was a lot of it — would not have come nearly as quickly without resorting to aggressive measures." He does not think those measure amounted to torture. "I do not believe that the word 'torture' was and is legally accurate," he said. "There were very harsh, very brutal methods. But not torture." Legally speaking, an attempt to resume waterboarding or other similarly harsh techniques would require new legislation reversing the measures put in place in recent years, legal scholars say. In practical political terms, any technique that amounts to torture is certain to provoke a firestorm of criticism. Trump raised the issue during the 2016 presidential campaign, saying, "I would bring back waterboarding, and I would bring back a hell of a lot worse than waterboarding." During the first days of the Trump administration in January 2017, McCain said: "The president can sign whatever executive orders he likes. But the law is the law. We are not bringing back torture in the United States of America." In addition, Defense Secretary Jim Mattis and other current and former officials in the military and intelligence communities have spoken out against waterboarding. Haspel was an undercover CIA officer for three decades and therefore has no public record. Some Democratic senators objected when she was named the CIA's deputy director a year ago, but that position did not require Senate confirmation. In addition to overseeing a black site prison in 2002, she was deeply involved in the 2005 decision to destroy videotapes of the waterboarding sessions. That action came after Congress had learned of the videos and called on them to be preserved. The Justice Department spent years investigating alleged abuses in the interrogation program, but no one was ever charged with a crime. Haspel's supporters say that she and others involved were asked to do a tough job and were given assurances that their actions were legal. "People in the prosecution of their duties inside government take on a great burden," said Danielle Pletka of the conservative American Enterprise Institute. "They do not deserve to be indicted on Twitter or by WikiLeaks or in the press before they get a hearing." For a time, Haspel was at the black site prison in Thailand where some al-Qaida suspects were interrogated after the Sept. 11 attacks. One big question is whether evidence obtained during their interrogations will be admissible at a trial for the suspects. Editor's note on March 16: In a previous version of this story, there was a reference to Gina Haspel's presence "at a black site prison in Thailand" where two al-Qaida suspects, Abu Zubaydah and Abd al-Rahim al-Nashiri, were interrogated. According to several media reports, including from ProPublica, she was "chief of base" at that site starting in 2002. But this week, ProPublica issued a retraction, a correction and an apology for some of its reporting on that point. It now says that Haspel was not in charge of that black site at the time of Zubaydah's interrogations and had not mocked his complaints about the treatment.